Above: Author Elizabeth Miller and her students. MOST WINTER MORNINGS, I bundle up in layers of wool and down, zip my ski uniform jacket to the collar, and head out to play with a half-dozen imps who almost inevitably pile up like so many puppies, a tangle of mittens, skis, and boots so heavy they struggle to lift their feet. 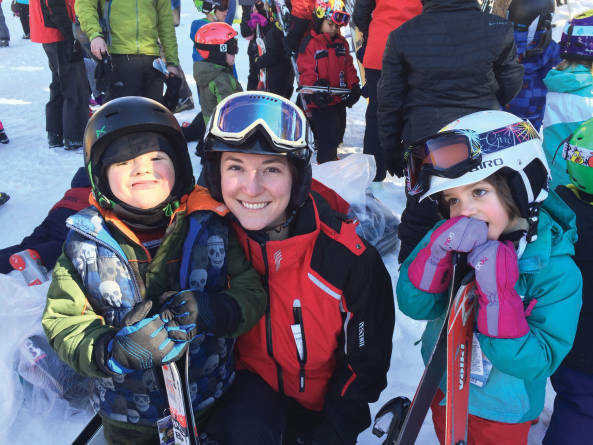 As a part-time instructor at Ski Santa Fe, I focus on the smallest beginners—who also happen to be the fastest learners. Today’s lesson starts on a sunny, flat spot near the base area, where we use those heavy boots to draw fans and rainbows in the snow. Then we step into one ski to scooter around in S-shapes—a gentle way to prepare wee muscle groups for wedge stops and parallel turns. But on this particular day, John isn’t slowing down for any of that. At age seven, he has no filter and no fear, so we move quickly to a surface lift and the top of the shortest slope on the mountain. He shuffles into place, takes a firm grip of my hand, and slides downhill, whooping the whole way. We chase a slalom course of mittens and work on increasing his control—and, for a kid convinced of his own indestructibility, his willingness to curb his speed. Is he making beautiful, parallel turns at the end of the day? No. Is he ready for “the big hill”? Not even close. But he is moving toward the chairlift by the end of our afternoon. The next morning? He comes back for another lesson and leaps into position. It’s easy to love the moments when well-trained five- and six-year-olds trail me down steep ski runs like ducklings. But after six years, teaching that first, neophyte day on snow still shines, especially with kids. No other single day will yield as much progress or produce as many moments of doubt turned to victory. I’ve watched kids laugh their way straight into snowbanks when they couldn’t bring their skis to a stop, quickly transform the skills and strength they built as soccer players or rollerbladers toward working the newly acquired planks on their feet, and bound up a hill just so they can glide back down again. We’ve dodged chairlift shadows and crouched to the ground while still sliding downhill to scoop up snow and see who can make the biggest snowball. We’ve caught snowflakes on our mittens to study their facets, particularly if kids come from states where snow is a rare miracle. None of this, I realize, sounds much like learning how to be the next Lindsey Vonn. While that goal might lie ahead, the path starts with two rules: Keep them safe, and make it fun. Jump onto terrain that’s too steep, and the hints of parallel turns showing up as their skis move closer together vanish in a “power wedge” aimed straight downhill. This braking mechanism remains a young skier’s most well-tested tool—and sometimes a hindrance to building more advanced skills. Take Nicole, an eleven-year-old who’s ready to start on intermediate terrain. We head for a wide trail with a couple of steep sections, but its entry is too tight for the wide radius turns she’s familiar with. Her first effort sees her riding a wedge barely angled across the hill. The tails of her skis clip the ungroomed snow as she squeezes in a turn. Where the run opens up, we play with the shapes and sizes of turns, carving smiles in the snow and thinking about pointing our toes toward the trees to slow down. On a second lap, she pins her turn into that opening corridor. On the third, her feet move even closer together. The whole mountain beckons, but old terrain provides comfortable territory to finesse new skills. We head next to a chute, where she learns to pivot on her skis even faster, but mostly, she laughs at how the steep sides of a tree-lined gully give her the same stomach butterflies that a roller coaster does. Kids are giddy with these new achievements, but I hope the experience also plants the roots of a lifelong love for the outdoors. So much can grow from that first whoop-inducing glide downhill, facing a crisp wind, and beholding the peaks that roll away forever. For me, the best days end with what I heard from John and his mom: “We’ll see you soon.” But those best days begin in the pre-dawn light, hiking uphill before the chairlifts even start rolling for a solo run as the sun rises and the snow turns from blue to gold. My addiction dates to days of shadowing my mother, also a ski instructor, as she wound graceful arcs through the moguls. Teaching is meant to set that line for the next generation. It’s a new window on the world, and a little nudge to love it.